Choosing Hallelujah: Why "Lavender *Sparkles*"? I'm sort of surprised the question doesn't come up more. Lavender *Sparkles* is, after all, an unusual name for a blog. And this blog doesn't seem to have anything to do with lavender OR sparkles...in fact the layout isn't even purple, let alone sparkly. I'm like the blog version of Grape-Nuts. But Zoanna asked a couple of weeks ago where my blog title came from. So here's the explanation (or lack thereof). I hate to disappoint you, but there's no real, logical reason for this crazy title. I'm absolutely terrible at titling, always have been. My favorite writing professor in college once drew a sad face next to a particularly terrible essay title. Truly. When I started this blog, way back in November 2003, I wanted a unique title. No offense to anyone in particular...but I didn't want to call my blog "Random Musings" or any variation of that, even though that was the first, natural thing that came to mind. It seemed lame, and I wanted to be a little more original. 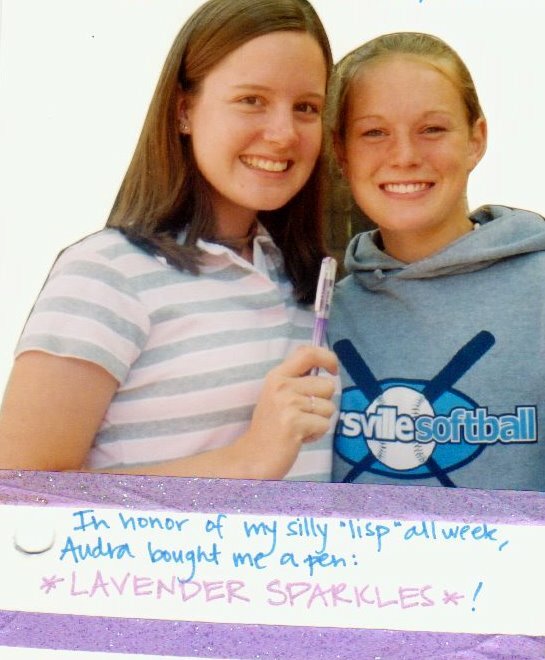 Lavender *Sparkles* was sort of a trademark/joke of mine back in the summer of 2002, when I was traveling from youth camp to camp on an IWU ministry team. Somewhere along the way--I can't remember now who got me started doing this--I began using a crazy lisp for fun (think "Sid the Sloth," if you've ever seen Ice Age). Just college students being silly. Anyway, at one camp, everyone was divided into "family groups," and the groups were labeled by color. Their name tags hung on colored ribbons. All but one of them were the typical colors: blue, red, green, orange, etc. And then there was a sparkly light purple. For reasons I can't even explain, we all got a big kick out of saying, "Lavender SPARKLES!" in that silly lisp voice. So I don't know if I had recently looked at my camp scrapbook back in November 2003, or what was going through my head. But somehow I had the flash of stupidity inspiration that instead of "Random Musings and Thoughts by Amy" I could call my blog "Lavender *Sparkles*". It's an improvement, right? Right? I've thought about changing it many, many times since then...but I just can't come up with anything better. The best I've been able to do is come up with an ever-so-slightly related tag line ("shine like a star"...sparkles...get it?...ok, never mind). I so admire the creative, meaningful blog titles others invent. There are the phrases from quotes or song lyrics (Chatting at the Sky), the clever people who play on their name (The Mental Ward), the people who are good at interesting turns of phrase (Just Another Pretty Farce). Then there are a few blogs who have ordinary titles, but their content is so good, you don't care--or the title is intentionally tongue-in-cheek, or deeper than it appears at first glance (Amy's Humble Musings, ordinary mother). And then there's me. Pretty much the only thing I've got going for me is "unique." So although I feel a little sheepish and ridiculous about it, until inspiration strikes, Lavender *Sparkles* it is. In the meantime, I am absolutely open to brilliant suggestions. Its a neat story, glad you shared. I did wonder about your blog title but never thought to ask. Now I know!! Myth-tery tholved. (Thatth my lispth:). Cute sthory. I think the memory of its origin still delights you, so keep it as one of those daily little "sparkles" God gives us just for our pleasure. Oh Lakeside!! I miss WoHoMis and everyone and all the silly traditions! My brother still does the lispy "lavender sparkles" every now and then...you must have been his mom. I think it's a very apt title and I've always liked the tie in "That I may shine like a star..." And of course, I'm honored that I get the inside joke, too.